I have several go-to dishes the ones I confidently turn to both because I know I can prepare them with little chance of having to call for pizza later, and because my family and friends always reach for more. 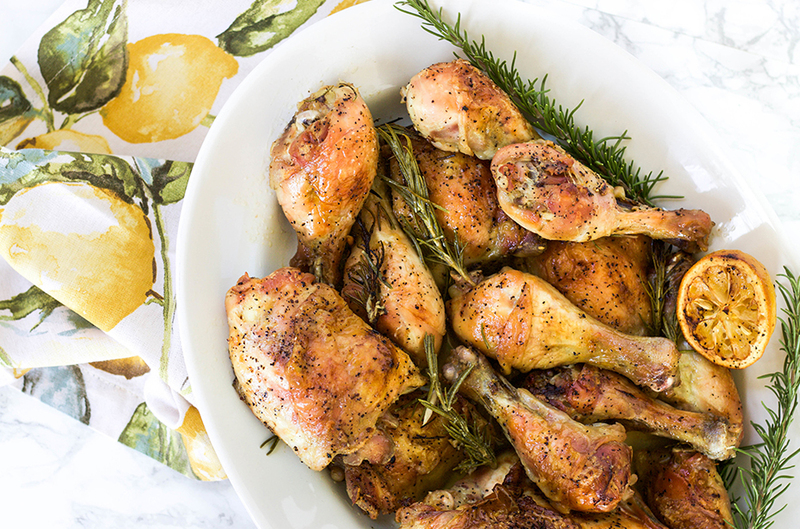 My roasted lemon chicken is the go-to of all my go-tos. It’s crispy on the outside and juicy and flavorful inside, and whether I make it for two or twelve, this bird is the word (sorry, I had to). It wasn’t always this way. I wasted many years and even more chickens trying to figure out how best to season chicken ? 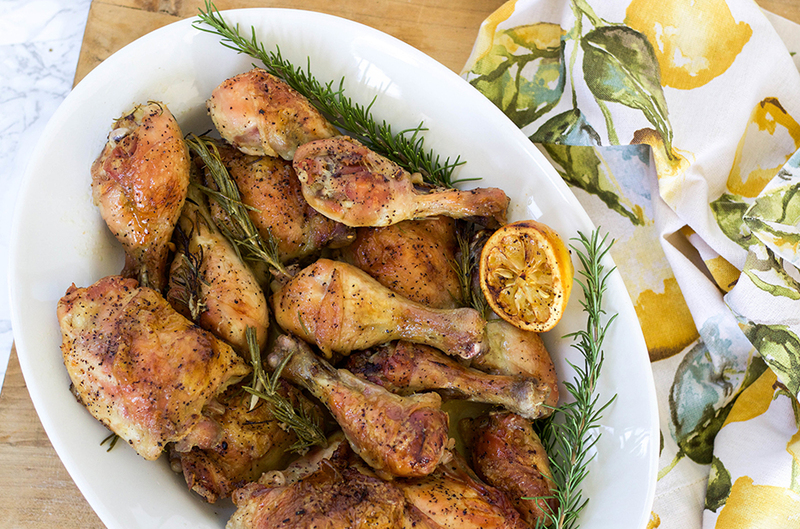 until Chef Jason Dady, a good friend and San Antonio restaurateur, told me the secret to juicy chicken was less about the right spices and more about the right oven temperature. Cook the chicken on high heat, he said, until it looks brown and crispy and then allow the chicken to finish cooking at rest. I use a meat thermometer and begin testing the meat about 15 minutes after resting (it should read 160 degrees), and the seemingly simple strategy just works. The other key is fresh chicken. I buy pasture-raised chicken on the same day I’m going to prepare it. Finally, any marinade will work with this approach, but a few hours of my marinade is good. Really good. I never measure the ingredients, so don’t get too caught up in exact amounts. Do make enough chicken for seconds. Pat the chicken dry with paper towels. Rub the skin with generous amounts of salt and pepper. 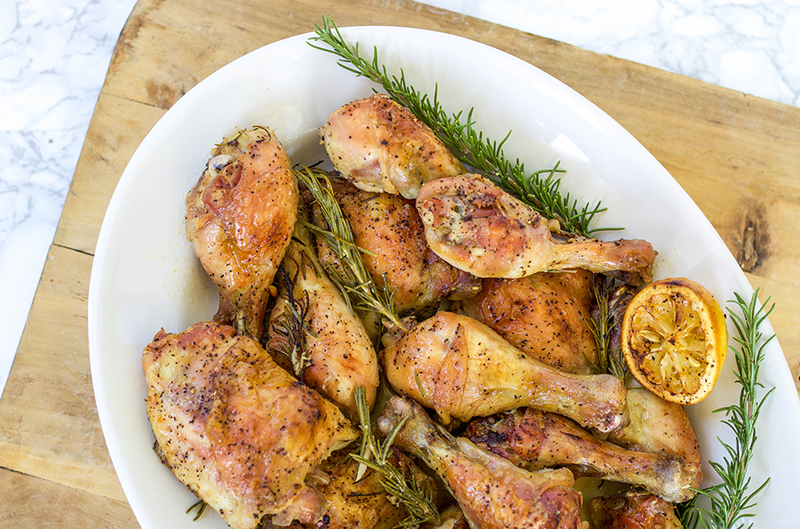 Place in a large Ziploc bag (or two, depending on amount) and drizzle with enough olive oil to coat all the chicken. Squeeze the juice of the lemons into the bag (remove the seeds first) and drop in the rinds. Add the crushed garlic cloves and rosemary sprigs. Seal the bag(s) well and move the chicken in the bag so the marinade ingredients are well dispersed. Refrigerate for at least 4 hours but up to 8. One hour before cooking, remove it from the fridge and bring it to room temperature. Heat oven to 475-500 degrees. Place the chicken in a large roasting pan, skin side up. Place in the oven and cook, uncovered, until the skin looks crispy (about 20-30 minutes depending on the amount of chicken and your oven). Lower the oven temperature to 150 degrees and allow the chicken to finish cooking at rest (another 15-25 minutes). Test the temperature by inserting a meat thermometer in the thickest part of the breast. It should read 160 degrees. Using a turkey baster, baste the chicken with some of the drippings, and serve immediately. A white Burgundy would be lovely with the chicken's lemony notes or for a red, try a medium-bodied California Cabernet. Don't rinse the chicken; it will only spread bacteria!